It's finished. Yes, I did a little happy dance, then got out the camera to try and take pictures. I do realise that some quilts are just too big to lay on the floor for photos. I would have taken it outside to hang up, but it was pouring rain out there. Measures about 70 inches square. I am planning to machine quilt feathers in those big open spaces. This will be a huge challenge for me as I've only done feathers a few times, but with patience and practise before hand, I'll get it done, eventually. To recap for new visitors, the large blocks were made during a year long BOM program at my local quilt shop. The pattern is "Building Blocks" by Sharyn Craig and the setting for the quilt is "All in the Family Sampler" in Judy Martin's book Knockout Blocks and Sampler Quilts. 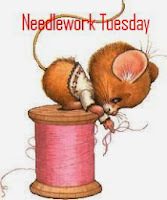 Did you work on needlework this past week, I'd love to see what you've been stitching. Add a link to your current post by using Mr. Linky and i'll be sure come visit and leave a comment. 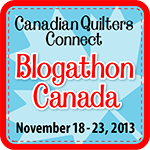 This week is the Canadian Quilters Connect Blogathon Canada. Lots of fun sites to visit and even some contests to enter. I have contest that I posted yesterday. You are invited to enter by visiting that post. that's a nice looking quilt!! Wow! I love how your star quilt turned out. Just amazing! Have fun with the feathers. I know you will do a wonderful job on them. Can't wait to see the results. Gorgeous quilt, Heather! I hope you'll keep us posting on your feathers. I was knitting up a storm this week. Thanks for including the Mr. Linky. Have a great week. Lovely Heather! I am adding more stars on my Smith Mountain Morning finish! Your star quilt looks great. Lovely quilt Heather. Well done. Stopping in from Kitchener. Love your Stars are Shining quilt. Very pretty. Should quilt quite nicely.